The Centaur Frame Tank by GEI Works is your premier solution for your firefighting, first response, and emergency situation needs. 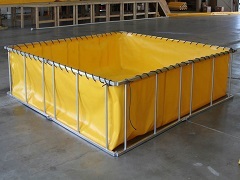 With a durable outer frame composed of sturdy aluminum or steel materials, these fire suppression tanks are equipped with a vast range of interior liners, from FDA and NSF 61 approved materials to UV resistant PVC and Nylon fabrics that are crafted for extended durations and extreme climate conditions, along with a discharge valve optimized for fire fighting and emergency response applications. The Centaur frame tanks fold up and can lay flat for ease of transportation and storage and they feature an open top for quick filling and emptying of liquids. As a result of the collapsible water tank design, the Centaur Frame Tank can be set up within minutes, filled, and rapidly dismantled, making it an ideal tool for liquid storage in urban, rural, and remote locations. Simply choose your desired location, fold open the frame, straighten and adjust the liner then fill with the liquid of your choice! For more information, visit our Centaur Frame Tank Product Flyer or our Frame Tank Installation Instructions. For more information, please visit our Centaur Frame Tank Specification page or our Centaur Frame Tank Emergency Response page. If you have questions about the Centaur Frame Tank, feel free to give us a call at 772-646-0597.